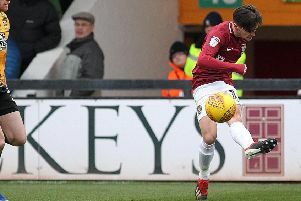 Assistant boss Dean Austin has praised the professionalism and attitude of sidelined Cobblers duo Regan Poole and David Buchanan. Up until the turn of the year, Buchanan was an automatic pick at left-back, while Poole was a regular feature in the starting line-up until a matter of weeks ago. That situation has now changed dramatically, with Buchanan not featuring for the first team since starting in the 3-1 win over Southend United on January 6 - a big change for a player who had been a virtual ever-present in the team since signing for the club in the summer of 2015. Manchester United loanee Poole hasn’t played since coming on as a substitute for the injured Shay Facey in the 1-0 defeat to Rochdale on February 3, and hasn’t started since the 1-1 draw at Blackburn on January 27. Neither player has even made the bench in recent weeks as manager Jimmy Floyd Hasselbaink tries to find the winning formula with his sizeable squad, but Austin says both players are still very much part of the first team squad. He also says the fact the pair can’t make the match-day 18 at the moment is an indicator of the difficult job Hasselbaink has in selecting a team each week. “Joe Bunney has come in and done very well, so David Buchanan has found himself out of the team,” said Austin. “David is a fantastic professional, he comes in every day, he does his work, and there is no moaning or griping, he just works extremely hard, and it is exactly the same with Regan. “We felt we had to make a change after the Blackburn game, and we felt we needed something different at AFC Wimbledon. On the selection headaches regularly facing Hasselbaink, Austin added: “The manager has a tough decision every week. “We come in every Friday and look at all the permutations that could happen on a Saturday in regard to positions, and if we have a problem with this position, or that position. “The hardest thing when you are picking a group, is you can only pick 11 on a Saturday, and at the moment we have 19 or 20 players who are all pushing hard for a place. “But that is the way it has to be, because they have to be ready for when they are called upon, and the could be called upon at any time. “The game changes so quickly, and somebody could get injured, or somebody loses form or gets sent-off, and the players are good here, we have a very hard working group.